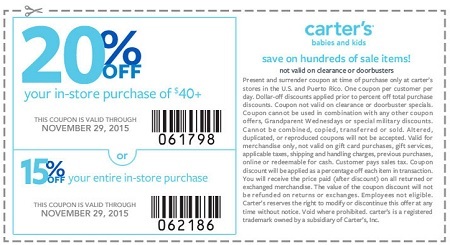 Pre-Black Friday Savings with printable coupon now available at U.S. carter's stores. Save on hundreds items! Take 20% off your in-store purchase of $40 or more. Or, take 15% off your entire in-store purchase. Plus, entire store on sale up to 50% off retail prices. Source of the information is carter's. Offer expires 11/29/2015. Coupon must be printed to receive the offer. More details available at stores.